More than 1000 educational scholarships worth Rs. 6.3 million were awarded to school children in Kilinochchi at an educational exhibition held there recently. The exhibition organised by the Security Forces in Kilinochchi was held on 28th and 29th June. 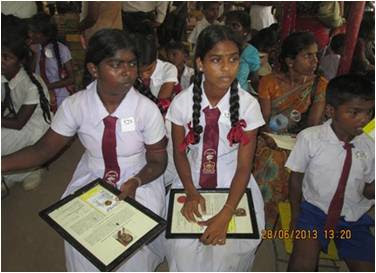 Students of Kilinochchi Tamil schools were joined by their Southern Sinhala schools counterparts in exhibiting their creations. It was a unique opportunity for the children of the North and South to join hands and build bridges of friendship while showcasing their artistic and creative abilities. Sri Lanka Army had sponsored 208 scholarships worth of Rs. 1.28 million while MAS holdings, one of Sri Lanka's largest garment exporters had sponsored 833 scholarships worth of Rs. 50 Million. Mr Isthikar Hussen had come forward with a scholarships worth of Rs. 25,300.00. Security forces have initiated a number of programmes to uplift the resettled community to rebuild their lives. Providing educational assistance is one of the major community development programmes undertaken by the security forces. The state is spending billions of rupees for the development of the Northern region. Under the National Reconciliation programme special provisions are made to revive the Northern educational sector. In addition to infrastructure development a large number of jobs have been created by state sector establishments to cater to the educational needs of the Tamil community. The state is fully committed in the development of the former theatre of conflict. It is quite unfortunate that some foreign nations have failed to comprehend the reality behind the propaganda of the terrorist rump. There is much to be desired in the machinations of certain sections of the Tamil diaspora. They are yet to prove their empathy towards their local brethren in terms of assistance to rebuild their lives. But it is imperative to state that their actions to rekindle the seeds of terrorism will effectively bring about a negative impact on the reconciliation and development of the Northern community. In contrast the Northern community is increasingly turning to the security forces in times of need. The commitment in rendering continued assistance to the community by the security forces has build better understanding and cooperation between the military and the civil populace. The two exhibition drew a crowd of more than 30,000 students and teachers from schools in the region. Security Force Commander, Kilinochchi Major General G.V.D.U.A. Perera attended as the chief guest. Hon. Governor of the Northern Province and provincial directors of education also attended the event.